Nine minutes. That’s all it took for the burglars to cut open an SBI cash machine in Irumpanam and decamp with Rs 22 lakh in the wee hours of Friday. IRUMPANAM: Nine minutes. That’s all it took for the burglars to cut open an SBI cash machine in Irumpanam and decamp with Rs 22 lakh in the wee hours of Friday. Photographs retrieved from the ATM revealed that two persons entered the enclosure, said SBI chief manager (CS and channel management) A K Dileep. “The parcel tray part of the ATM machine is made of alloy and it is not easy to cut it using a gas cutter or similar devices. However, here, the robbers could cut the tray in nine minutes and leave in less than 15 minutes. Only an expert can cut the metal tray in such a short duration,” he said. This ATM didn’t have a security guard. All SBI ATMs are directly connected to the security wing in Mumbai. The last transaction reported was at 11.30 pm on Thursday. “From the first CCTV camera, it is revealed that the masked robbers entered the ATM at 3.16 am. They sprayed paint over the first CCTV camera. They brought a bottle of water to cool down the machine, which turns hot while cutting it. 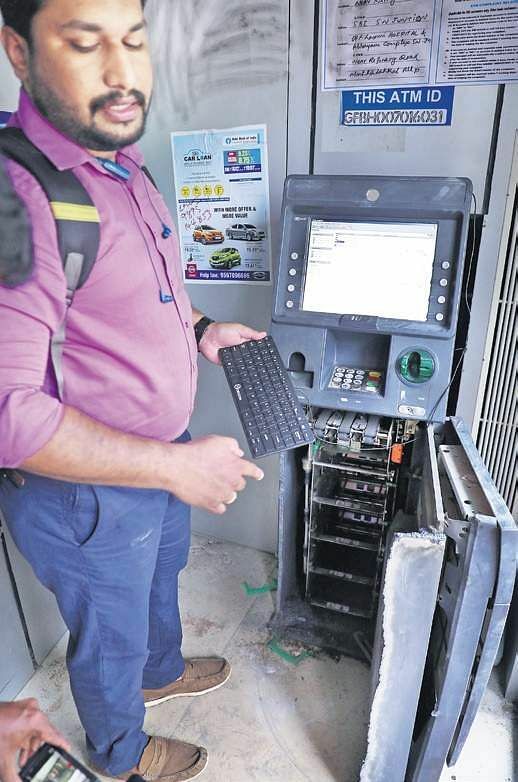 By around 3.29 am, they left the ATM after successfully cutting the machine,” said Dileep. The ATM is maintained by an agency called Electronic Payment & Services (EPS), which manages many SBI ATMs on a contract basis. “At 3.28 am, our Mumbai office received an error notification. The theft was detected when our employees reached the ATM to repair it on Friday morning. There were currencies worth around Rs 22 lakh inside the ATM,” said an EPS employee.After spraying paint on the CCTV camera, the men took off their masks and started cutting the machine. “There is another camera hidden inside the ATM machine. The camera records still pictures of people standing in front of the ATM. From that camera, we could receive clear pictures, which show the face of the robbers. The images have been handed over to the police. Our security wing is also looking into the incident,” said Dileep. Added an SBI officer: “Around three years ago, some persons attempted to rob the same ATM. However, they did not succeed. This incident is different from that.” A police team, including city police commissioner M P Dinesh, examined the spot. “Information has been passed on to all police stations. An alert will be sent based on the images. We have also sought the assistance of the Cyber Cell. We will be able to identify and track down the culprits soon,” said assistant commissioner P P Shams. Shams suspects the same gang was involved in another ATM robbery that took place in Koratty on Friday. There also, spray paint was used to mask the CCTV camera. From the photographs and CCTV footage, the police suspect three men from outside the state were involved. The gang reached the ATM in a car. While two persons entered the ATM, the third remained in the car. “We are gathering mobile phone data from nearby towers. Similarly, CCTV cameras on the road and shops located near the ATMs are also being checked,” said an officer.